Developing and promoting entrepreneurship education has been one of the key policy objectives of the EU institutions and Member States for many years. 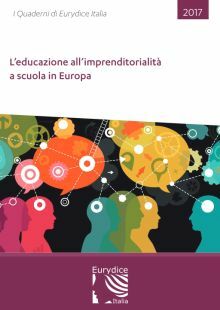 The new publication of Eurydice Italy, entitled “Entrepreneurship education at school in Europe” aims to provide an overview of Entrepreneurship education in European. The report focuses on primary education, lower and general upper secondary education as well as school-based initial vocational education and training. The report is the translation in Italian of the comparative analysis of the Eurydice network “Entrepreneurship education at School in Europe” and provides a synthesis of the main outcomes of the report, including national definitions, context indicators, strategic actions and funding schemes in support of entrepreneurship education. The publication provides up-to-date information on strategies, curricula, and learning outcomes, covering also funding and teachers’ training. The Italian version of the report provides also a selection of 9 national informative sheets, selected for their interest and for geographical representation from the 38 National Information Sheets of the original version in English.